Hello Kuzak Closet Readers! My name is Ashlie, I’m Amanda’s sister and I am back on the blog with a Spring Cleaning Edition of 7 Minutes…7 Pins. I hope after reading today’s post it will inspire you to organize some of those cluttered areas of your house. My first pin is a great way to get organized as you clean out a room. I use this system when I go through my daughter’s closets and it helps keep me not so overwhelmed. We use bags not boxes–but it’s the same concept. I always put the bags immediately into my van so I can take them to donate or recycle ASAP. If you are unsure of what to do with old electronics and cell phones this website gives a great list of options and even tells you how the sites will pay you. Need to get your stainless steel sparkling again? Here is a quick homemade cleaning solution that is sure to make yours shine again! It’s nice to have a dedicated place for all those random items that you may come across as you spring clean. This next pin turns a closet into a home for instruction manuals, light bulbs, cleaning products and more! No more searching around the house when you need a battery or extension cord. It’s all housed in one spot. Spring is a great time to get your medicine cabinet organized. Decide how you would like to sort items. In my house we have a bin for adult medications and another one dedicated to medication for children. Check the expiration dates on all items and see what needs to be restocked. 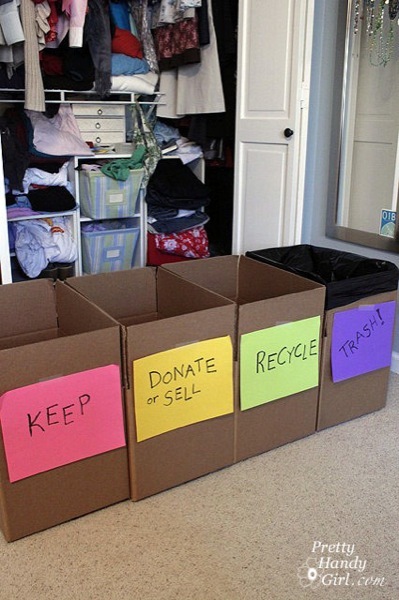 In the below picture these little bins can be found at Walmart or The Dollar Store. We have featured this next pin on 7 Minutes…7 Pins before but it was a popular one. This tackle box was turned int battery storage. What a simple yet effective idea. With a quick glance you can tell which batteries need to be restocked! Now that the snow is gone (hopefully) give your front porch a little T.L.C. Scrub it down with some soapy warm water and wash any windows. Add a fresh doormat and some flowers. If you need some inspiration Kuzak Closet has a Pinterest Board that is all front porches. Take a look! Thanks for reading. I hope you enjoyed the latest 7 Minutes…7 Pins Edition. Be sure to follow along on our Kuzak Closet Pinterest Page for ideas on entertaining, decorating and of course organizing!